The easiest Chicken Fajitas EVER! 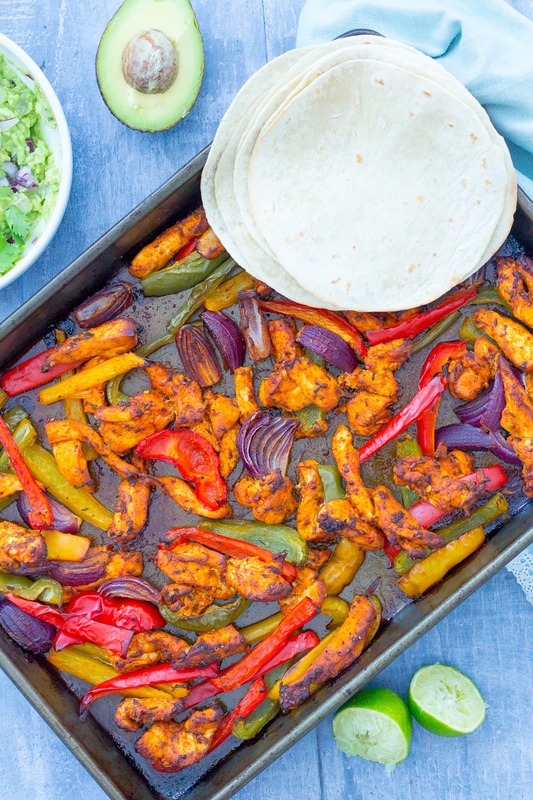 My Easy Sheet Pan Chicken Fajitas are oven baked on one tray – meaning less hands-on time, less washing up, gorgeous roasted peppers and even tastier chicken! What’s not to like? Many of my blogging friends affectionately know me as the Traybake Queen – I am so passionate about this style of cooking. It makes my life so much easier: just a few minutes of prep, then let the oven do all the hard work AND there’s so little washing up! Perfect for busy midweek evenings. Not only is this style of cooking easier, it’s also tastier – we all know how much nicer ROASTED FOOD tastes, right? Know what else I’m super passionate about? Mexican flavours! 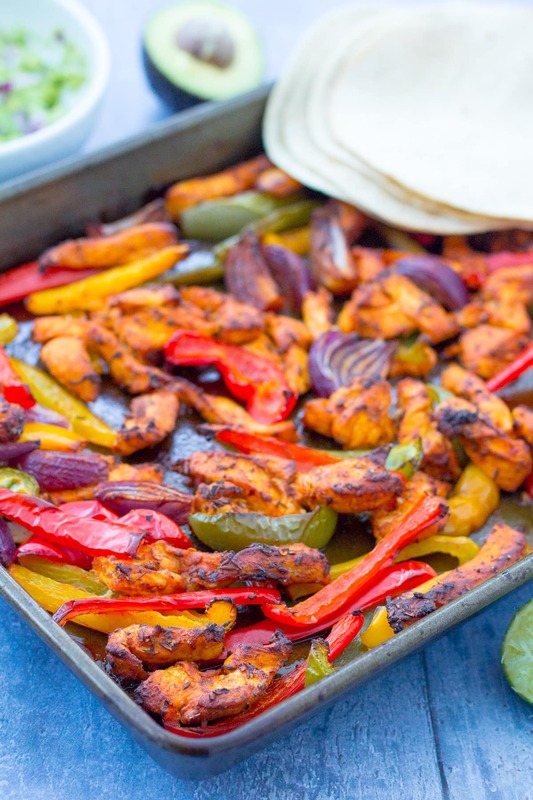 So what better way to combine my two loves than in this dish – Easy Sheet Pan Chicken Fajitas? Erm, Eb… why ‘sheet pan’? 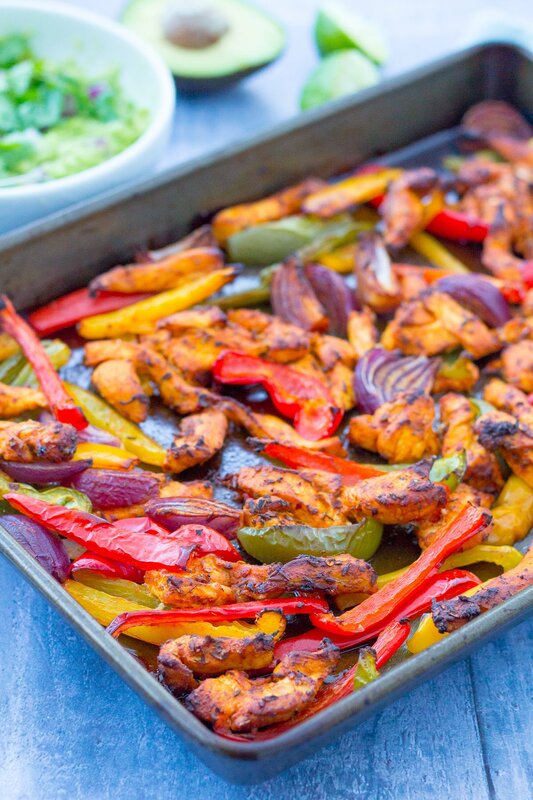 Well, I did toy with calling this dish Easy Chicken Fajitas Traybake – but, believe it or not I’m not the first person to come up with the idea of oven baked chicken fajitas (I know – crazy, huh?) and this style of cooking all in one baking tray is often known as ‘sheet pan’ cooking – especially in the USA. 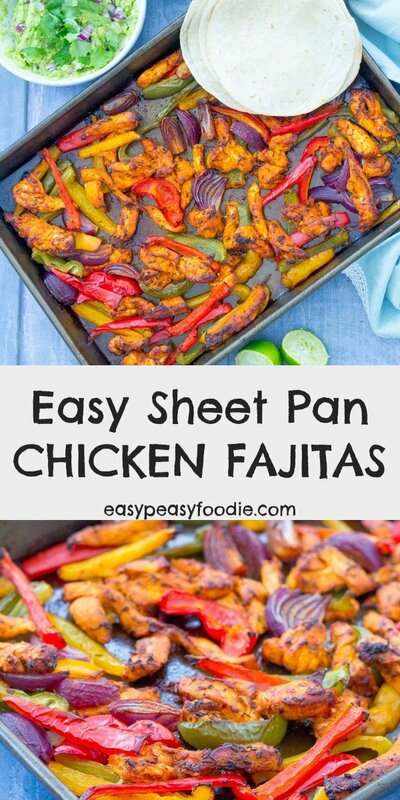 I checked to see which version more people were searching for on Google and it’s definitely Easy Sheet Pan Chicken Fajitas. So that’s what I went for. I want this recipe to get found by as many people as possible – because it is SOOOO GOOD!! It doesn’t matter whether you call these Chicken Fajitas Traybake or Sheet Pan Chicken Fajitas – these are the easiest chicken fajitas you’ll ever make! Create a super simple chicken fajita marinade – then add the chicken, peppers and onions. Mix together, spread out on a baking tray (AKA a sheet pan!) and roast in a hot oven for 20 minutes. 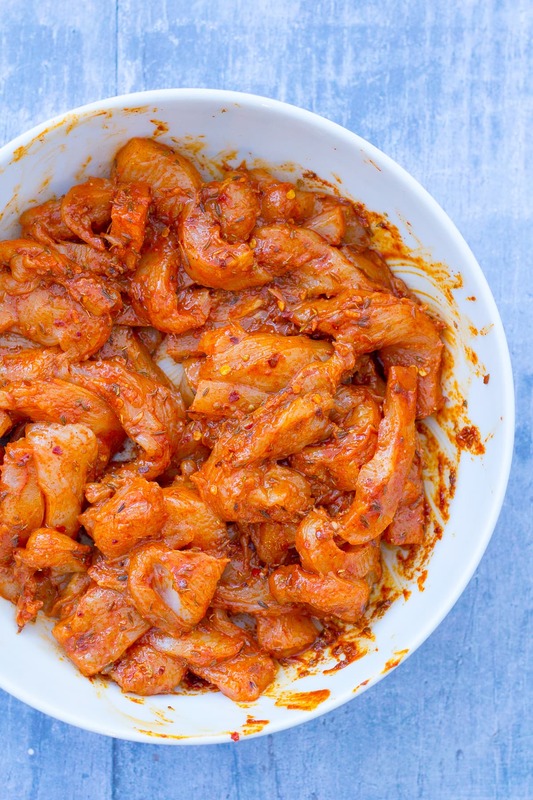 If you have a little more time on your hands, you can absolutely leave the chicken to marinate in the marinade for a while – an hour or two is great, up to 24 hours if you can! This will make the dish even more flavoursome and the chicken even more tender – but it’s not essential. Not only does this neat sheet pan shortcut mean making chicken fajitas is ten times easier. 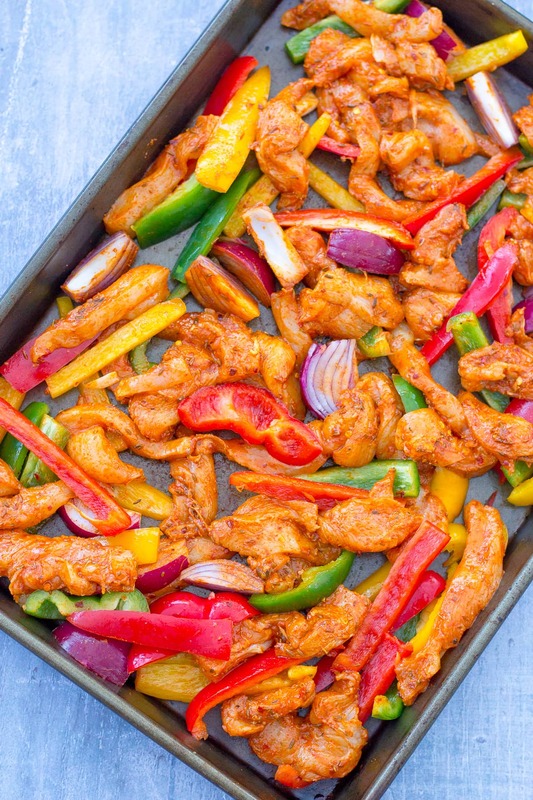 Oven baking this dish means much tastier chicken fajitas too! We all know how much nicer roasted peppers and roasted onions are, right? And I don’t need to tell you how good roasted chicken is, do I? Now imagine that effect smothered in Mexican flavours and all the flavours of the dish intermingled and you get the idea… Serious levels of yumminess! I’m pretty confident in saying that I will NEVER go back to the standard frying pan way of making chicken fajitas EVER AGAIN!! The best way to cook Chicken Fajitas for a crowd! Not only does this make for a great way to cook chicken fajitas for a simple weeknight dinner, it’s also a great way to cook chicken fajitas for a crowd. Anyone who has tried to cook chicken fajitas for more than about 4 people will know that it involves a lot of frying pan juggling, and usually the frustration that nothing really gets that ‘charred’ flavour and everything kind of steams rather than fries, right? Well oven baking is the perfect way to cook Chicken Fajitas for a bigger group and avoid ALL these problems. The recipe below is for 4 people and fits in one large baking tray – but so long as you have the oven space, you can simply up the quantities and use more oven trays and voilà – an easy, delicious way to feed a crowd! What to serve with Easy Sheet Pan Chicken Fajitas? This traybaked version of Chicken Fajitas goes with everything the regular chicken fajitas go with: guacamole, salsa, sour cream, cheddar cheese, fresh coriander (cilantro), or whatever else you usually serve with your fajitas! On a busy weeknight, I like to use the 20 minutes I have while my chicken is in the oven to quickly make up a batch of my Homemade Chunky Guacamole and / or my Easy Peasy Salsa Fresca. What wine goes with Chicken Fajitas? Matching wine with chicken fajitas can be a bit tricky: normally white wine goes best with chicken, but because of all those spicy charred flavours, actually a fruity rosé or even a red works surprisingly well here. If you want to stick to white, go for either a Chilean or New Zealand Sauvignon Blanc, which works really well with the zingy zesty lime and fresh coriander flavours. Alternatively, try a fruity French or Spanish Grenache-based rosé or red, which goes so well with those smoky, spicy, charred flavours and the sweet peppers. What to do with leftover Chicken Fajitas? I always make extra Sheet Pan Chicken Fajitas because it makes SUCH GOOD LEFTOVERS! You can either eat it cold as a wrap or with salad the next day. Or do what I do, and turn it into a kind of ‘chicken fajita chilli con carne’, simply by adding tinned tomatoes! I place the chicken and some chopped tinned tomatoes in a saucepan and heat until the chicken is piping hot all the way through and the tomatoes have reduced to a lovely rich, spicy tomato sauce. Serve either with rice or just with an extra generous helping of leftover guacamole and /or some sour cream for a low carb lunch! 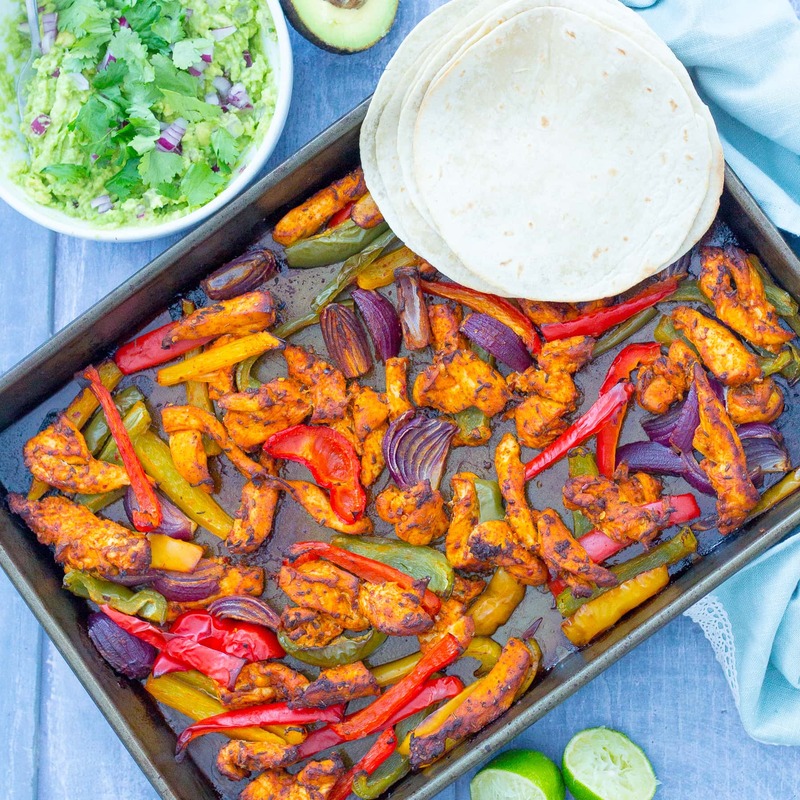 My Easy Sheet Pan Chicken Fajitas also freeze beautifully if you want to save the leftovers for a time further in the future or fancy a spot of batch cooking. Your choice of guacamole / sour cream / salsa / grated cheese / extra limes & coriander / tortilla chips to serve - any or all of them! Preheat your oven to 220C / 200C fan / gas mark 7 / 425F. Wrap the tortillas in foil and place in the oven for the last 8 minutes of cooking time. Remove from the oven but keep wrapped in foil until needed. Sprinkle the chicken with the chopped coriander and serve in the pan on the table, together with the warm tortilla wraps and whatever extras you have chosen for people to make up their own fajitas. Enjoy! These look lovely. I always fry fajitas so this is a healthier alternative. Must give it a try. We absolutely love fajitas in our house and I love your way of making them super easy to cook. I’m not sure what you mean by leftover fajitas though…? If I make more, my husband will just eat more so there aren’t any leftovers! 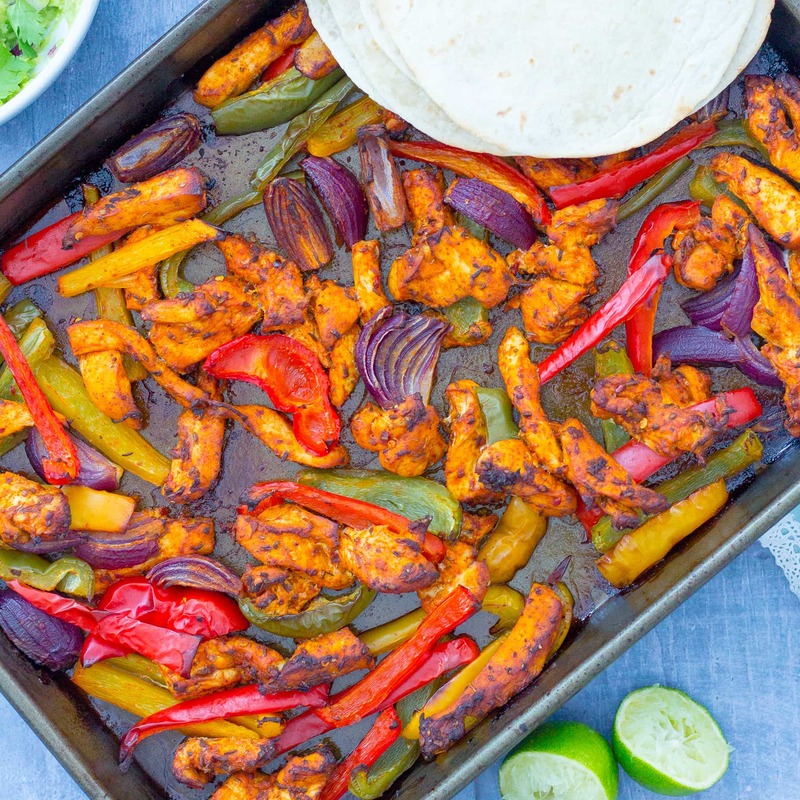 Chicken fajitas are a regular Saturday night meal in our house but I always do them on the hob top – or rather my hubby does – it’s one of the few meals he actually enjoys cooking! I love the sheet pan idea – less cleaning up is always a winner! This would be perfect for our Taco Tuesday or Round the World Wednesday nights! Oh my goodness! You definitely outdid yourself on this one. Looks so good!